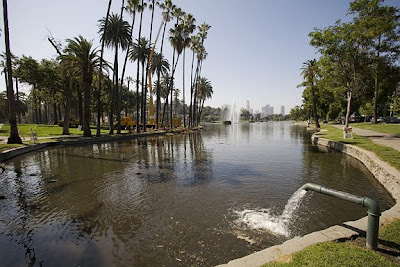 The famous Lotus plants of Echo Park Lake failed to bloom this year. Instead most of plants have died. LA City officials speculated up to 13 different reasons may have been the reasons for the massive die-off including bad water quality, plant poaching-they are edible, and pest. This Lotus field has been around since the 1920's when Aimee Semple McPherson, founder of the Angelus Temple across the street from the lake, is said to have planted them from plants she imported from China. 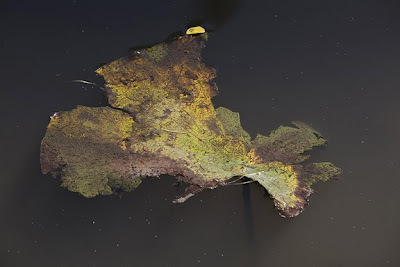 There were a few Lotus leaves that pushed their way through the unusually brown murky and foul smelling water this spring, only to quickly brown rot and die. 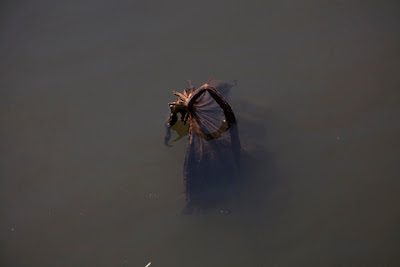 The annual 2008 Lotus Festival held at the lake is two weeks away with no Lotus blooms in sight. The Lotus is a symbol of divine beauty in the Hindu religion and is considered a sacred plant.